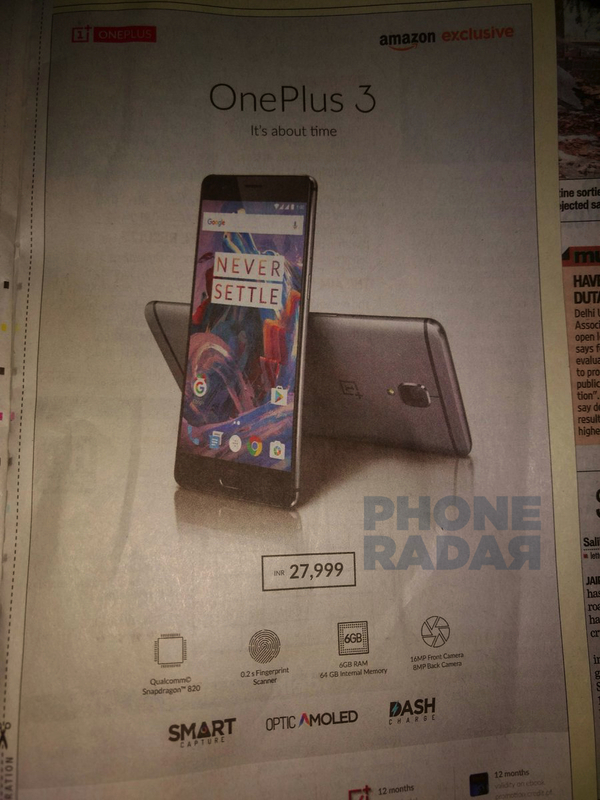 Today a newspaper advertisement has revealed the official price of the OnePlus 3 Smartphone in India. We were already suspecting the price of Rs 28,000 & the following clipping confirms the same at Rs 27,999. This roughly translates to $417 but then it is probably on the higher side when compared to the last years model. There were earlier speculations that the brand would launch 2 variants with 4GB & 6GB of RAM but now it is all clear that they are going to up from the last years flagship killer with a 6GB of RAM, that’s not yet available in any Smartphone available in India. There are already reports that the Galaxy Note 7 that is going to launch at the Unpacked event in August 2016. We were tipped by our reader Chirag Sharma, while the advertisement was published in the Hindustan Times newspaper. It clearly looks like a mistake & the advertisement was published one day in advance, but this clears all the pricing doubts. Finally, there’s some progress that most of the users who have been following the One Plus 3 launch have been waiting. There are a total of 7200 units of the Smartphone being imported as reported by Zauba on 9th June. According to the Import data, the phones imported are in Graphite colour & could be the first batch since the website reports data generally late. A total of 105 Media Kit boxes have also been Imported along with the Smartphones that should go on sale after the official launch on 15th June in India. There were 3 more shipments tracked, totalling up to 24,480 units of this Smartphone model being imported to India. 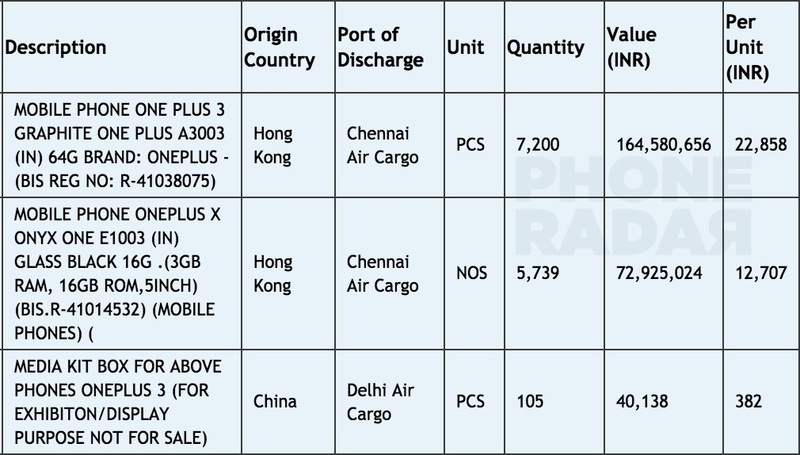 The Import pricing is at Rs 22,858 that’s almost close to the pricing of the One Plus 2 Import pricing of Rs 22,606 & that hints that the retail price of One Plus 3 phone may be also around Rs 24,999. We are not sure about this but the speculations are based on what was seen during the OnePlus 2 launch last year. OnePlus 3 will be officially launched in the next couple of weeks, and now we are getting even more details about it. With the TENAA listing, we already came to known most of the specifications along with the first look of the device. Now the updated device page on TEENA confirmed the OnePlus 3 to launch with 6GB of RAM. Yesterday, ASUS also launched the Zenfone 3 Deluxe with 6GB of RAM while already a few Chinese manufacturers are offering the same. The Vivo XPlay 5 is the first smartphone to come with 6GB of RAM. The OnePlus 3 launch will be streamed via 360-degree video to make the users experience it in virtual reality. OnePlus is also offering 30,000 free Loop VR headsets for experiencing the latest flagship device launch in Virtual Reality. Apart from the bump in RAM capacity, all the other specifications remain same on both variants. It comes with an all metal body with a physical home button on the front that also houses the fingerprint sensor. It features a 5.5-inch AMOLED display with Full HD resolution and is powered by Snapdragon 820 quad-core processor along with Adreno 530 GPU. It includes 64GB of internal storage and there is no MicroSD card slot for storage expansion. The OnePlus 3 sports a 16MP rear camera with dual tone LED flash and an 8MP front camera. It is backed by a 3,000mAh battery and might also support Quick Charge 3.0. The device comes with dual SIM card slots and runs on latest Android 6.0.1 Marshmallow OS. The Alert Slide, which was present on OnePlus 2 and OnePlus X, is also present on this device. Connectivity options include 4G LTE, VoLTE, Wi-Fi, Bluetooth, NFC, GPS, and a USB Type-C port. It measures 152.6 x 74.6 x 7.3 mm and weighs 160 grams. Along with Black and White color variants, the OnePlus 3 will be also available in Gold color. Stay tuned for more updates!